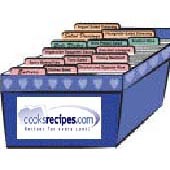 This pet food recipe for Cheese Dog Bites was submitted by Diana Hatfield-Bixby. Mix flour and cheese together. Add butter. Slowly add milk until a stiff dough forms (you may not need all of the milk). Knead dough on floured work surface for a few minutes. Roll out to 1/4-inch thickness. Cut into desired shapes and place on an ungreased baking sheet. Bake at 350°F (175°C) for 15 minutes. Let cool in oven with the door slightly open until cold and firm. Store in the refrigerator.